Menu driven interface integrates with the keyboard. Dimensions 3 5/8"H x 5 7/8"W x 10 1/4"D. Weight 2 lbs. Built-in Printer (you don't need to purchase a separate printer). 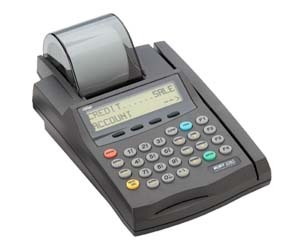 The Nurit 2085 is a ruggedly designed credit card terminal that can handle higher than normal abuse in field use. It doesn't come with a pin-pad but an external pin-pad can be easily added. It supports a call store and forward transactions mode which will allow the terminal to operate for short time periods without a phone line. The system will store the transactions and once you arrive at a destination with a phone line, you can simply plug the terminal in to the phone line and process all the stored transactions. This gives it a semi-wireless footprint and can be a very attractive feature for some merchants.